Many of my objects are found in nature and reveal a history of wear and tear from being in the elements. In restoring some of the integrity of the pieces, I enjoy bringing out the beauty of their forms, their imperfections, and missing parts. I am drawn to the concept of repairing with gold, a bringing together of separate parts in golden joinery. 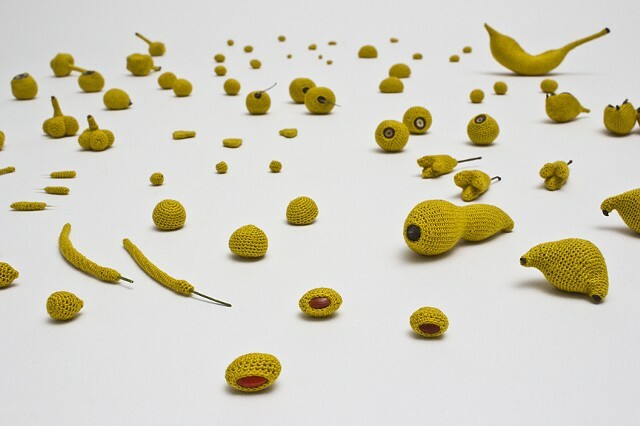 The crocheted stitches build up as form-fitting skins that serve as blankets, patches, band-aids and support. As I discover and garner these natural forms, my meticulous stitching becomes an act of veneration, bringing attention to what has been abandoned, broken, dismissed. In a mysterious way the coverings reveal more vividly what is already there and bring our their natural essense/presence. As in gilding, these false “skins” imbue the objects with an assumed desirability or value. In this restorative process, I consider whether this instinct to protect is a nurturing or control of nature. Esther Traugot received her BFA from the University of California Berkeley in 2005 and her MFA from Mills College in 2009. Traugot’s work has been exhibited in the Bay Area at venues such as the College of Marin Fine Arts Gallery, the Marin Museum of Contemporary Art, the Bedford Gallery in Walnut Creek, The Palo Alto Art Center, and the Berkeley Art Center, as well as the Irvine Fine Arts Center, the El Paso Museum of Art, El Paso, TX, Kathryne Markell Fine Arts, Chelsea, NY. Her work is on view at, and is part of the permanent collection, at Neiman Marcus in Walnut Creek and in Beverly Hills. Internationally her work has been exhibited in “Florilegio” in Bogota Columbia, and was shown at the Art Paris Art Fair 2014. Traugot is represented at Chandra Cerrito Contemporary Gallery in Oakland, CA, and with Muriel Guepin Gallery in New York, NY.